Vitamin D3 is one of the most important vitamins in the human body, but is also one of the top deficiencies. Up to 80% of your body's D3 comes from direct exposure of your skin to sunlight. Because exposure to sunlight can be limited for many people, especially during the winter months, deficiencies can be quite common. While vitamin D3 can be found in foods, the amounts are very little, which leaves supplementation as an alternative to sun exposure. 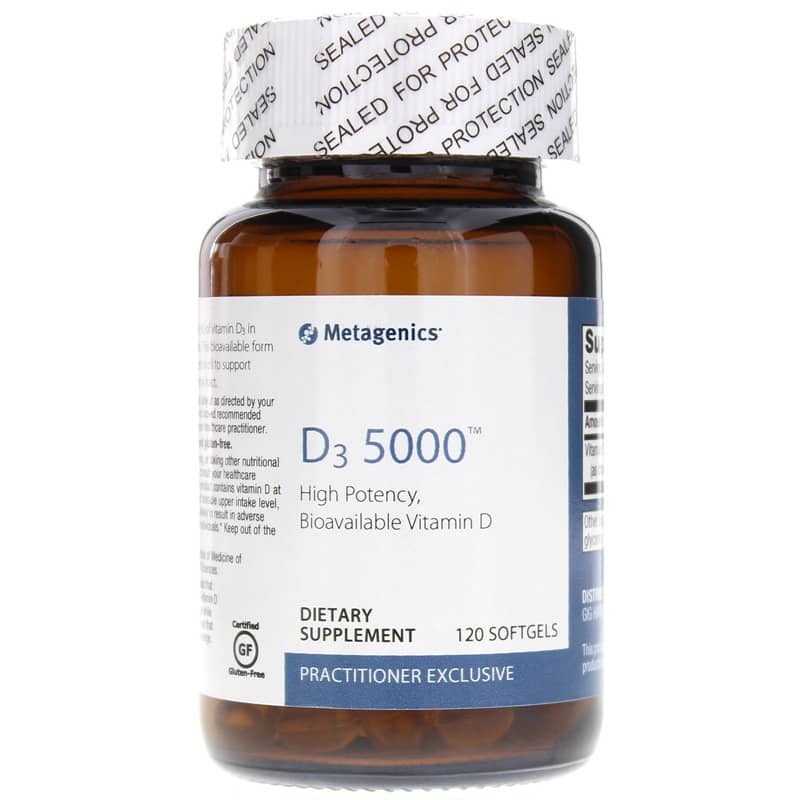 D3 5000 IU from Metagenics is the ideal supplement option to maintain healthy D3 levels. Make the right choice to replenish your vitamin D levels. Choose D3 5000 IU from Metagenics today and stay on the all-natural pathway to optimal overall health and wellness. Order now! Adults: Take one softgel daily or as directed by your healthcare practitioner. Do not exceed recommended dosage unless directed by your healthcare practitioner. If pregnant or nursing, taking other nutritional supplements or medication, consult your healthcare practitioner before use. 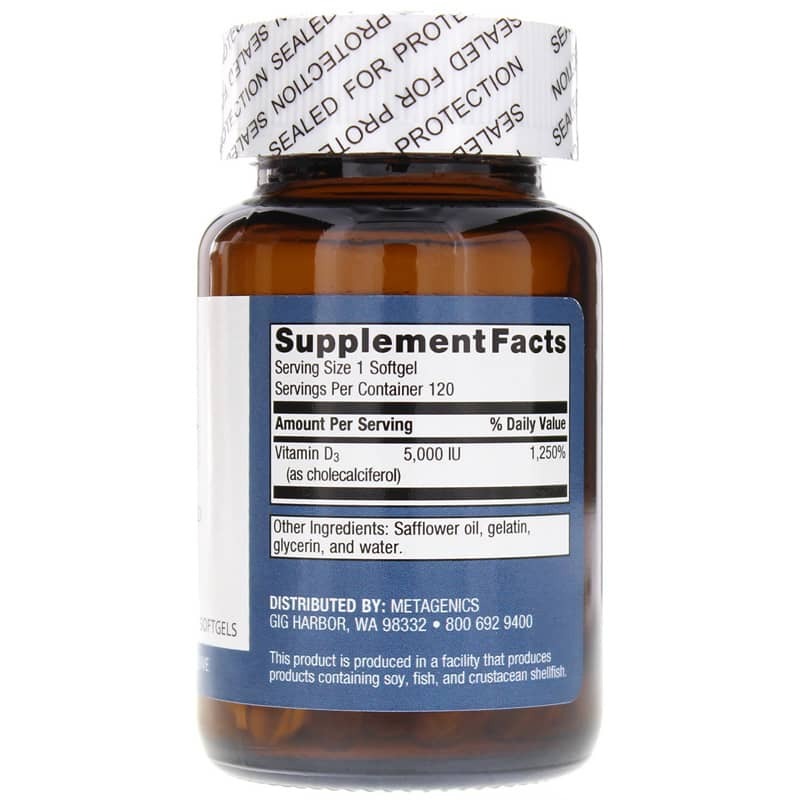 This product contains vitamin D at a level that exceeds the adult tolerable upper intake level, the maximum daily intake unlikely to result in adverse effects in the most sensitive individuals. ** Keep out of the reach of children. 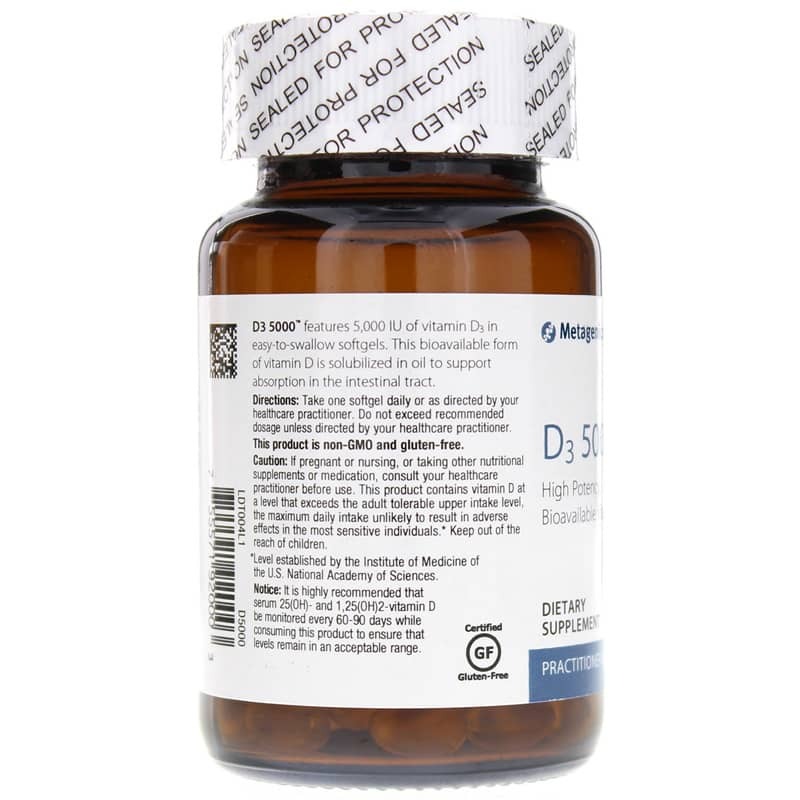 It is highly recommended that serum 25- and 1,25-dihydroxyvitamin D be monitored every 60-90 days while consuming this product to ensure that levels remain in an acceptable range. ** Level established by the Institute of Medicine of the U.S. National Academy of Sciences. Definitely has a great taste, is well tolerated by my stomach. Great Recommendation by my Dr. Price is great! Will be ordering regularly. Excellent product, easy ordering process and great follow up. My Naturopathic prescribed and sold me this brand of vitamin D3 but at a much higher cost. When I found out how important it is to supplement D3 when you don't produce your own D2 in sunshine, I thought I'd buy the best I can. This one's good.